her journey to becoming Britain’s longest and oldest reigning monarch. This stunning Silver layered Crown Coin features the third of these portraits by Raphael Maklouf . Raphael Maklouf – a well-established sculptor and Associate of the Royal Society of British Sculptors – was chosen to create the new portrait. Maklouf’s approach differed to that of Gillick and Machin. The portrait is ‘couped’ – cut off at the neck – and the Queen wears the Royal Diamond Diadem often seen at the State opening of Parliament, along with earrings and a necklace. More importantly, she looks younger than fifty eight (her age at the time) but this was simply a successful reflection of Maklouf’s desire to create ‘a symbol, regal and ageless’. The reverse symbolizes the shields of the Royal Arms. Located at the north and south positions are the shields that represent England, containing three lions passant. A lion rampant represents Scotland in the east position, and to the west is a harp that represents Ireland. The four quadrants depict the St. Edwards crown, encircled by the Latin inscription ‘NOVEM DECENNIS GLORIOSE PERACTIS’ (nine decades gloriously accomplished). 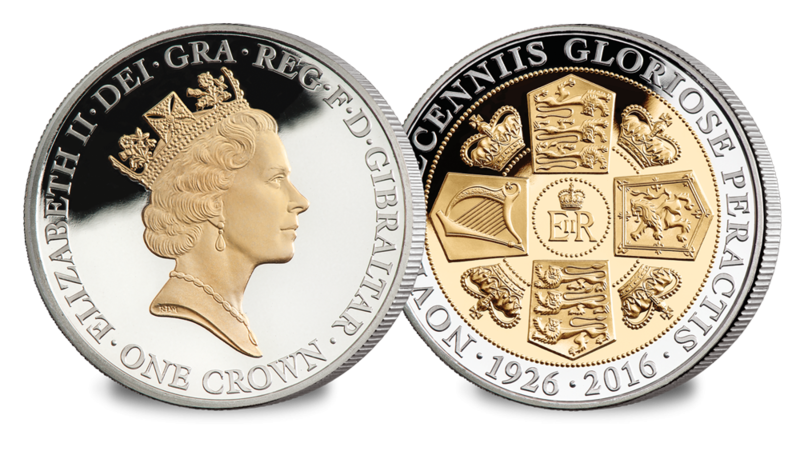 The year dates 1926-2016 to represent Her Majesty’s 90th Birthday.